The State Art Museum of Florida is growing a larger and more loyal audience through Trip Advisor. 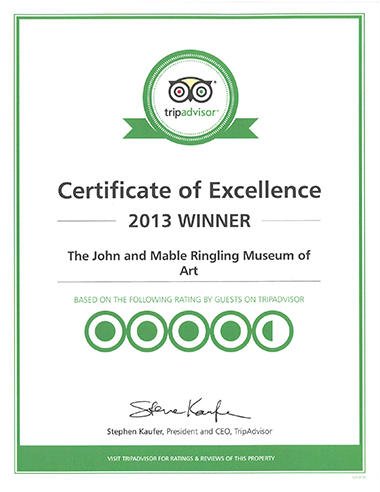 As a recent recipient of Trip Advisor’s 2013 Certificate of Excellence for Top Performing Business, The Ringling is now ranked in the top 10% worldwide for positive traveler feedback. Over 700 volunteers and staff work together daily to ensure each and every visitor has a memorable experience. From the Ambassadors and Front Line staff to the Curators and Educators, to the Security and Grounds Crew, each team member plays an important role in creating an environment that is inclusive and inviting for the many international tourists that make The Ringling their destination. Through the support of the teams at Florida State University, The Ringling Museum of Art, Ca’ d’Zan, Historic Asolo Theater, Circus Museum, Art Library and Bayfront Gardens showcase incredible exhibitions, performances, programs and events 362 days a year and continue to offer rich resources for researching artists and scholars. It is an honor and a privilege to be part of Florida State University and to operate as the State Art Museum of Florida.